For other uses, see Solon (disambiguation). Solon was born in Athens around 630 BC. His family was distinguished in Attica as they belonged to a noble or Eupatrid clan, although they possessed only moderate wealth. Solon's father was probably Execestides. If so, Solon's lineage could be traced back to Codrus, the last King of Athens. According to Diogenes Laërtius, he had a brother named Dropides who was an ancestor (six generations removed) of Plato. According to Plutarch, Solon was related to the tyrant Peisistratos, for their mothers were cousins. Solon was eventually drawn into the unaristocratic pursuit of commerce. When Athens and Megara were contesting the possession of Salamis, Solon was made leader of the Athenian forces. After repeated disasters, Solon was able to improve the morale of his troops through a poem he wrote about the island. Supported by Peisistratos, he defeated the Megarians either by means of a cunning trick or more directly through heroic battle around 595 BC. The Megarians, however, refused to give up their claim. The dispute was referred to the Spartans, who eventually awarded possession of the island to Athens on the strength of the case that Solon put to them. According to Diogenes Laertius, in 594 BC, Solon was chosen archon, or chief magistrate. As archon, Solon discussed his intended reforms with some friends. Knowing that he was about to cancel all debts, these friends took out loans and promptly bought some land. Suspected of complicity, Solon complied with his own law and released his own debtors, amounting to 5 talents (or 15 according to some sources). His friends never repaid their debts. After he had finished his reforms, he travelled abroad for ten years, so that the Athenians could not induce him to repeal any of his laws. His first stop was Egypt. There, according to Herodotus, he visited the Pharaoh of Egypt, Amasis II. According to Plutarch, he spent some time and discussed philosophy with two Egyptian priests, Psenophis of Heliopolis and Sonchis of Sais. According to Plato's dialogues, Timaeus and Critias, he visited Neith's temple at Sais and received from the priests there an account of the history of Atlantis. Next, Solon sailed to Cyprus, where he oversaw the construction of a new capital for a local king, in gratitude for which the king named it Soloi. Solon's travels finally brought him to Sardis, capital of Lydia. According to Herodotus and Plutarch, he met with Croesus and gave the Lydian king advice, which Croesus failed to appreciate until it was too late. Croesus had considered himself to be the happiest man alive and Solon had advised him, "Count no man happy until he be dead." The reasoning was that at any minute, fortune might turn on even the happiest man and make his life miserable. It was only after he had lost his kingdom to the Persian king Cyrus, while awaiting execution, that Croesus acknowledged the wisdom of Solon's advice. After his return to Athens, Solon became a staunch opponent of Peisistratos. In protest, and as an example to others, Solon stood outside his own home in full armour, urging all who passed to resist the machinations of the would-be tyrant. His efforts were in vain. Solon died shortly after Peisistratos usurped by force the autocratic power that Athens had once freely bestowed upon him. Solon died in Cyprus at the age of 80 and, in accordance with his will, his ashes were scattered around Salamis, the island where he was born. The travel writer Pausanias listed Solon among the seven sages whose aphorisms adorned Apollo's temple in Delphi. Stobaeus in the Florilegium relates a story about a symposium where Solon's young nephew was singing a poem of Sappho's; Solon, upon hearing the song, asked the boy to teach him to sing it. When someone asked, "Why should you waste your time on it?" Solon replied ἵνα μαθὼν αὐτὸ ἀποθάνω, "So that I may learn it before I die." Ammianus Marcellinus, however, told a similar story about Socrates and the poet Stesichorus, quoting the philosopher's rapture in almost identical terms: "ut aliquid sciens amplius e vita discedam", meaning "in order to leave life knowing a little more". During Solon's time, many Greek city-states had seen the emergence of tyrants, opportunistic noblemen who had taken power on behalf of sectional interests. In Sicyon, Cleisthenes had usurped power on behalf of an Ionian minority. In Megara, Theagenes had come to power as an enemy of the local oligarchs. The son-in-law of Theagenes, an Athenian nobleman named Cylon, made an unsuccessful attempt to seize power in Athens in 632 BC. Solon was described by Plutarch as having been temporarily awarded autocratic powers by Athenian citizens on the grounds that he had the "wisdom" to sort out their differences for them in a peaceful and equitable manner. According to ancient sources, he obtained these powers when he was elected eponymous archon (594/3 BC). Some modern scholars believe these powers were in fact granted some years after Solon had been archon, when he would have been a member of the Areopagus and probably a more respected statesman by his peers. The social and political upheavals that characterized Athens in Solon's time have been variously interpreted by historians from ancient times to the present day. Two contemporary historians have identified three distinct historical accounts of Solon's Athens, emphasizing quite different rivalries: economic and ideological rivalry, regional rivalry and rivalry between aristocratic clans. These different accounts provide a convenient basis for an overview of the issues involved. "...there was conflict between the nobles and the common people for an extended period. For the constitution they were under was oligarchic in every respect and especially in that the poor, along with their wives and children, were in slavery to the rich...All the land was in the hands of a few. And if men did not pay their rents, they themselves and their children were liable to be seized as slaves. The security for all loans was the debtor's person up to the time of Solon. He was the first people's champion." "Athens was torn by recurrent conflict about the constitution. The city was divided into as many parties as there were geographical divisions in its territory. For the party of the people of the hills was most in favour of democracy, that of the people of the plain was most in favour of oligarchy, while the third group, the people of the coast, which preferred a mixed form of constitution somewhat between the other two, formed an obstruction and prevented the other groups from gaining control." Regional rivalry is a theme commonly found among modern scholars. "The new picture which emerged was one of strife between regional groups, united by local loyalties and led by wealthy landowners. Their goal was control of the central government at Athens and with it dominance over their rivals from other districts of Attika." Regional factionalism was inevitable in a relatively large territory such as Athens possessed. In most Greek city states, a farmer could conveniently reside in town and travel to and from his fields every day. According to Thucydides, on the other hand, most Athenians continued to live in rural settlements right up until the Peloponnesian War. The effects of regionalism in a large territory could be seen in Laconia, where Sparta had gained control through intimidation and resettlement of some of its neighbours and enslavement of the rest. Attika in Solon's time seemed to be moving towards a similarly ugly solution with many citizens in danger of being reduced to the status of helots. Rivalry between clans is a theme recently developed by some scholars, based on an appreciation of the political significance of kinship groupings. According to this account, bonds of kinship rather than local loyalties were the decisive influence on events in archaic Athens. An Athenian belonged not only to a phyle or tribe and one of its subdivisions, the phratry or brotherhood, but also to an extended family, clan or genos. It has been argued that these interconnecting units of kinship reinforced a hierarchic structure with aristocratic clans at the top. Thus rivalries between aristocratic clans could engage all levels of society irrespective of any regional ties. In that case, the struggle between rich and poor was the struggle between powerful aristocrats and the weaker affiliates of their rivals or perhaps even with their own rebellious affiliates. The historical account of Solon's Athens has evolved over many centuries into a set of contradictory stories or a complex story that might be interpreted in a variety of ways. As further evidence accumulates, and as historians continue to debate the issues, Solon's motivations and the intentions behind his reforms will continue to attract speculation. Solon's laws were inscribed on large wooden slabs or cylinders attached to a series of axles that stood upright in the Prytaneion. These axones appear to have operated on the same principle as a Lazy Susan, allowing both convenient storage and ease of access. Originally the axones recorded laws enacted by Draco in the late 7th Century (traditionally 621 BC). Nothing of Draco's codification has survived except for a law relating to homicide, yet there is consensus among scholars that it did not amount to anything like a constitution. Solon repealed all Draco's laws except those relating to homicide. During his visit to Athens, Pausanias, the 2nd century AD geographer reported that the inscribed laws of Solon were still displayed by the Prytaneion. Fragments of the axones were still visible in Plutarch's time but today the only records we have of Solon's laws are fragmentary quotes and comments in literary sources such as those written by Plutarch himself. Moreover, the language of his laws was archaic even by the standards of the fifth century and this caused interpretation problems for ancient commentators. Modern scholars doubt the reliability of these sources and our knowledge of Solon's legislation is therefore actually very limited in its details. Generally, Solon's reforms appear to have been constitutional, economic and moral in their scope. This distinction, though somewhat artificial, does at least provide a convenient framework within which to consider the laws that have been attributed to Solon. Some short-term consequences of his reforms are considered at the end of the section. Before Solon's reforms, the Athenian state was administered by nine archons appointed or elected annually by the Areopagus on the basis of noble birth and wealth. The Areopagus comprised former archons and it therefore had, in addition to the power of appointment, extraordinary influence as a consultative body. The nine archons took the oath of office while ceremonially standing on a stone in the agora, declaring their readiness to dedicate a golden statue if they should ever be found to have violated the laws. There was an assembly of Athenian citizens (the Ekklesia) but the lowest class (the Thetes) was not admitted and its deliberative procedures were controlled by the nobles. There therefore seemed to be no means by which an archon could be called to account for breach of oath unless the Areopagus favoured his prosecution. According to the Constitution of the Athenians, Solon legislated for all citizens to be admitted into the Ekklesia and for a court (the Heliaia) to be formed from all the citizens. The Heliaia appears to have been the Ekklesia, or some representative portion of it, sitting as a jury. By giving common people the power not only to elect officials but also to call them to account, Solon appears to have established the foundations of a true republic. However some scholars have doubted whether Solon actually included the Thetes in the Ekklesia, this being considered too bold a move for any aristocrat in the archaic period. Ancient sources credit Solon with the creation of a Council of Four Hundred, drawn from the four Athenian tribes to serve as a steering committee for the enlarged Ekklesia. However, many modern scholars have doubted this also. There is consensus among scholars that Solon lowered the requirements—those that existed in terms of financial and social qualifications—which applied to election to public office. The Solonian constitution divided citizens into four political classes defined according to assessable property a classification that might previously have served the state for military or taxation purposes only. The standard unit for this assessment was one medimnos (approximately 12 gallons) of cereals and yet the kind of classification set out below might be considered too simplistic to be historically accurate. The Areopagus, as viewed from the Acropolis, is a monolith where Athenian aristocrats decided important matters of state during Solon's time. valued at 500 medimnoi or more of cereals annually. valued at 300 medimnoi or more annually. valued at a 200 medimnoi or more annually. manual workers or sharecroppers, they served voluntarily in the role of personal servant, or as auxiliaries armed for instance with the sling or as rowers in the navy. According to the Athenian Constitution, only the pentakosiomedimnoi were eligible for election to high office as archons and therefore only they gained admission into the Areopagus. A modern view affords the same privilege to the hippeis. The top three classes were eligible for a variety of lesser posts and only the thetes were excluded from all public office. Solon's economic reforms need to be understood in the context of the primitive, subsistence economy that prevailed both before and after his time. Most Athenians were still living in rural settlements right up to the Peloponnesian War. Opportunities for trade even within the Athenian borders were limited. The typical farming family, even in classical times, barely produced enough to satisfy its own needs. Opportunities for international trade were minimal. It has been estimated that, even in Roman times, goods rose 40% in value for every 100 miles they were carried over land, but only 1.3% for the same distance were they carried by ship and yet there is no evidence that Athens possessed any merchant ships until around 525 BC. Until then, the narrow warship doubled as a cargo vessel. Athens, like other Greek city states in the 7th Century BC, was faced with increasing population pressures and by about 525 BC it was able to feed itself only in 'good years'. The Croeseid, one of the earliest known coins. It was minted in the early 6th century BC in Lydia. Coins such as this might have made their way to Athens in Solon's time but it is unlikely that Athens had its own coinage at this period. Fathers were encouraged to find trades for their sons; if they did not, there would be no legal requirement for sons to maintain their fathers in old age. Foreign tradesmen were encouraged to settle in Athens; those who did would be granted citizenship, provided they brought their families with them. Cultivation of olives was encouraged; the export of all other fruits was prohibited. Competitiveness of Athenian commerce was promoted through revision of weights and measures, possibly based on successful standards already in use elsewhere, such as Aegina or Euboia or, according to the ancient account but unsupported by modern scholarship, Argos. It is generally assumed, on the authority of ancient commentators that Solon also reformed the Athenian coinage. However, recent numismatic studies now lead to the conclusion that Athens probably had no coinage until around 560 BC, well after Solon's reforms. Nevertheless, there are now reasons to suggest that monetization had already begun before Solon's reforms. By early sixth century the Athenians were using silver in the form of a variety of bullion silver pieces for monetary payments. Drachma and obol as a term of bullion value had already been adopted, although the corresponding standard weights were probably unstable. Solon's economic reforms succeeded in stimulating foreign trade. 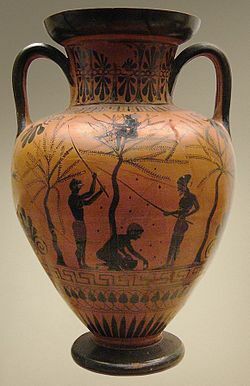 Athenian black-figure pottery was exported in increasing quantities and good quality throughout the Aegean between 600 BC and 560 BC, a success story that coincided with a decline in trade in Corinthian pottery. The ban on the export of grain might be understood as a relief measure for the benefit of the poor. However, the encouragement of olive production for export could actually have led to increased hardship for many Athenians to the extent that it led to a reduction in the amount of land dedicated to grain. Moreover, an olive produces no fruit for the first six years (but farmers' difficulty of lasting until payback may also give rise to a mercantilist argument in favour of supporting them through that, since the British case illustrates that 'One domestic policy that had a lasting impact was the conversion of "waste lands" to agricultural use. Mercantilists felt that to maximize a nation's power all land and resources had to be used to their utmost...'). The real motives behind Solon's economic reforms are therefore as questionable as his real motives for constitutional reform. Were the poor being forced to serve the needs of a changing economy, was the economy being reformed to serve the needs of the poor, or were Solon's policies the manifestation of a struggle taking place between poorer citizens and the aristocrats? In his poems, Solon portrays Athens as being under threat from the unrestrained greed and arrogance of its citizens. Even the earth (Gaia), the mighty mother of the gods, had been enslaved. The visible symbol of this perversion of the natural and social order was a boundary marker called a horos, a wooden or stone pillar indicating that a farmer was in debt or under contractual obligation to someone else, either a noble patron or a creditor. Up until Solon's time, land was the inalienable property of a family or clan and it could not be sold or mortgaged. This was no disadvantage to a clan with large landholdings since it could always rent out farms in a sharecropping system. A family struggling on a small farm however could not use the farm as security for a loan even if it owned the farm. Instead the farmer would have to offer himself and his family as security, providing some form of slave labour in lieu of repayment. Equally, a family might voluntarily pledge part of its farm income or labour to a powerful clan in return for its protection. Farmers subject to these sorts of arrangements were loosely known as hektemoroi indicating that they either paid or kept a sixth of a farm's annual yield. In the event of 'bankruptcy', or failure to honour the contract stipulated by the horoi, farmers and their families could in fact be sold into slavery. This 6th century Athenian black-figure urn, in the British Museum, depicts the olive harvest. Many farmers, enslaved for debt, would have worked on large estates for their creditors. annulment of all contracts symbolised by the horoi. prohibition on a debtor's person being used as security for a loan, i.e., debt slavery. release of all Athenians who had been enslaved. The removal of the horoi clearly provided immediate economic relief for the most oppressed group in Attica, and it also brought an immediate end to the enslavement of Athenians by their countrymen. Some Athenians had already been sold into slavery abroad and some had fled abroad to escape enslavement – Solon proudly records in verse the return of this diaspora. It has been cynically observed, however, that few of these unfortunates were likely to have been recovered. It has been observed also that the seisachtheia not only removed slavery and accumulated debt but may also have removed the ordinary farmer's only means of obtaining further credit. the abolition of extravagant dowries. legislation against abuses within the system of inheritance, specifically with relation to the epikleros (i.e. a female who had no brothers to inherit her father's property and who was traditionally required to marry her nearest paternal relative in order to produce an heir to her father's estate). entitlement of any citizen to take legal action on behalf of another. the disenfranchisement of any citizen who might refuse to take up arms in times of civil strife, and war, a measure that was intended to counteract dangerous levels of political apathy. Demosthenes claimed that the city's subsequent golden age included "personal modesty and frugality" among the Athenian aristocracy. Perhaps Solon, by both personal example and legislated reform, established a precedent for this decorum. A heroic sense of civic duty later united Athenians against the might of the Persians. Perhaps this public spirit was instilled in them by Solon and his reforms. (See also Solon and Athenian sexuality below). After completing his work of reform, Solon surrendered his extraordinary authority and left the country. According to Herodotus the country was bound by Solon to maintain his reforms for 10 years, whereas according to Plutarch and the author of the Athenian Constitution (reputedly Aristotle) the contracted period was instead 100 years. A modern scholar considers the time-span given by Herodotus to be historically accurate because it fits the 10 years that Solon was said to have been absent from the country. Within 4 years of Solon's departure, the old social rifts re-appeared, but with some new complications. There were irregularities in the new governmental procedures, elected officials sometimes refused to stand down from their posts and occasionally important posts were left vacant. It has even been said that some people blamed Solon for their troubles. Eventually one of Solon's relatives, Peisistratos, ended the factionalism by force, thus instituting an unconstitutionally gained tyranny. In Plutarch's account, Solon accused Athenians of stupidity and cowardice for allowing this to happen. Solon's verses have come down to us in fragmentary quotations by ancient authors such as Plutarch and Demosthenes who used them to illustrate their own arguments. It is possible that some fragments have been wrongly attributed to him and some scholars have detected interpolations by later authors. He was also the first citizen of Athens to reference the goddess Athena (fr. 4.1–4). The literary merit of Solon's verse is generally considered unexceptional. Solon's poetry can be said to appear 'self-righteous' and 'pompous' at times and he once composed an elegy with moral advice for a more gifted elegiac poet, Mimnermus. Most of the extant verses show him writing in the role of a political activist determined to assert personal authority and leadership and they have been described by the German classicist Wilamowitz as a "versified harangue" (Eine Volksrede in Versen). According to Plutarch however, Solon originally wrote poetry for amusement, discussing pleasure in a popular rather than philosophical way. Solon's elegiac style is said to have been influenced by the example of Tyrtaeus. He also wrote iambic and trochaic verses which, according to one modern scholar, are more lively and direct than his elegies and possibly paved the way for the iambics of Athenian drama. We desire, and drive away our bitter shame! It is possible that Solon backed up this poetic bravado with true valour on the battlefield. As a regulator of Athenian society, Solon, according to some authors, also formalized its sexual mores. According to a surviving fragment from a work ("Brothers") by the comic playwright Philemon, Solon established publicly funded brothels at Athens in order to "democratize" the availability of sexual pleasure. While the veracity of this comic account is open to doubt, at least one modern author considers it significant that in Classical Athens, three hundred or so years after the death of Solon, there existed a discourse that associated his reforms with an increased availability of heterosexual contacts. Attic pleaders did not hesitate to attribute to him (Solon) any law which suited their case, and later writers had no criterion by which to distinguish earlier from later works. Nor can any complete and authentic collection of his statutes have survived for ancient scholars to consult. And they say Solon loved [Peisistratos]; and that is the reason, I suppose, that when afterwards they differed about the government, their enmity never produced any hot and violent passion, they remembered their old kindnesses, and retained "Still in its embers living the strong fire" of their love and dear affection. A century after Plutarch, Aelian also said that Peisistratos had been Solon's eromenos. Despite its persistence, however, it is not known whether the account is historical or fabricated. It has been suggested that the tradition presenting a peaceful and happy coexistence between Solon and Peisistratos was cultivated during the latter's dominion, in order to legitimize his own rule, as well as that of his sons. Whatever its source, later generations lent credence to the narrative. 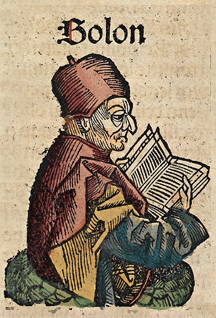 Solon's presumed pederastic desire was thought in antiquity to have found expression also in his poetry, which is today represented only in a few surviving fragments. The authenticity of all the poetic fragments attributed to Solon is however uncertain – in particular, pederastic aphorisms ascribed by some ancient sources to Solon have been ascribed by other sources to Theognis instead. ^ "In all areas then it was the work of Solon which was decisive in establishing the foundations for the development of a full democracy. "—Marylin B. Arthur, 'The Origins of the Western Attitude Toward Women', in Women in the Ancient World: The Arethusa Papers, John Patrick Sullivan (ed. ), State University of New York (1984), page 30. "In making their own evaluation of Solon, the ancient sources concentrated on what were perceived to be the democratic features of the constitution. But...Solon was given his extraordinary commission by the nobles, who wanted him to eliminate the threat that the position of the nobles as a whole would be overthrown".— Stanton G.R. Athenian Politics c800–500BC: A Sourcebook, London: Routledge (1990), p. 76. ^ Stanton, G. R. Athenian Politics c. 800–500 BC: A Sourcebook, Routledge, London (1990), p. 76. ^ Stanton G. R. Athenian Politics c. 800–500 BC: A Sourcebook, Routledge, London (1990), pp. 1–5. ^ Diogenes Laërtius, The Lives and Opinions of Famous Philosophers, Book 3 "Plato", chapter 1. ^ Plutarch Solon 1 s:Lives (Dryden translation)/Solon#1. ^ Pausanias 10.24.1 (e.g. Jones and Omerod trans. ). ^ Hignett C. A History of the Athenian Constitution to the End of the Fifth Century B.C. (Oxford University Press 1952). ^ Athenaion Politeia 2.1–2.3 s:Athenian Constitution#2. ^ P. Rhodes, A Commentary on the Aristotelian Athenian Politeia, Oxford University Press (1981) 186. ^ Marilyn Skinner (2013). Sexuality in Greek and Roman Culture (Ancient Cultures), 2nd edition. Wiley-Blackwell. p. 139. ISBN 978-1-4443-4986-3. Buckley, T. Aspects of Greek History. London: Routledge, 1996. Dillon, M and L Garland. Ancient Greece: Social and Historical Documents from Archaic Times to the Death of Alexander the Great. London: Routledge, 2010. W. R. Everdell, The End of Kings: A History of Republics and Republicans, Chicago: University of Chicago Press, 2000. Martin Litchfield West, Iambi et elegi Graeci ante Alexandrum cantati2 : Callinus. Mimnermus. Semonides. Solon. Tyrtaeus. Minora adespota,, Oxonii: e typographeo Clarendoniano 1972, revised edition 1992 x + 246 pp. T. Hudaon-Williams, Early Greek Elegy: Ekegiac Fragments of Callinus, Archilochus, Mimmermus, Tyrtaeus, Solon, Xenophanes, and Others, # Taylor and Francis (1926), ISBN 0-8240-7773-3. Christoph Mülke, Solons politische Elegien und Iamben : (Fr. 1 - 13, 32 - 37 West), Munich (2002), ISBN 3-598-77726-4. Noussia-Fantuzzi, Maria, Solon the Athenian, the Poetic Fragments. Brill (2010). Eberhard Preime, Dichtungen : Sämtliche Fragmente / Solon Munich (1940). Eberhard Ruschenbusch Nomoi : Die Fragmente d. Solon. Gesetzeswerkes, Wiesbaden : F. Steiner (1966). Hall, Jonathan. 2013. "The Rise of State Action in the Archaic Age." In A Companion to Ancient Greek Government. Edited by Hans Beck, 9–21. Chichester, UK: Wiley-Blackwell. Lewis, John. 2006. Solon the Thinker: Political Thought in Archaic Athens. London: Duckworth. Schubert, Charlotte. 2012. Solon. Tübingen, Germany: Francke. Wallace, Robert W. 2009. "Charismatic Leaders." In A Companion to Archaic Greece. Edited by Kurt Raaflaub and Hans van Wees, 411–426. Malden, MA: Wiley-Blackwell. Wikimedia Commons has media related to Solon. Laërtius, Diogenes (1925). "The Seven Sages: Solon" . Lives of the Eminent Philosophers. 1:1. Translated by Hicks, Robert Drew (Two volume ed.). Loeb Classical Library. Chisholm, Hugh, ed. (1911). "Solon" . Encyclopædia Britannica. 25 (11th ed.). Cambridge University Press. pp. 366–368.